Macrumors today reported that they discovered images in the developer release of iOS 4.3 Beta 2 which confirm the existence of three new camera based Apple apps that are now said to debut with Apple’s next-generation iPad2 which is slated to be launched in April. Two of the apps that were discovered were the Camera and FaceTime which were no surprise considering the rumors flying around the internet. 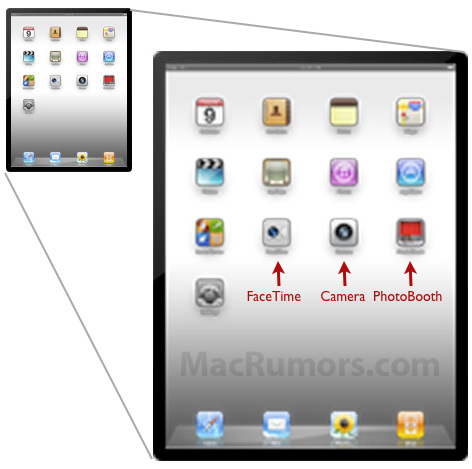 Apple will be pushing Facetime across all of its devices after its success with the iPhone 4. There is however a third app which is an official PhotoBooth app to their camera suite for the iPad 2. PhotoBooth is an Apple application that uses the iSight camera to replicate the function of a photo booth. So iPad buyers hold up for another couple of months because rumors are that the iPad price will be dropped to $150 when iPad 2 hits the stores.